‘Dignity in Dementia’ works with families, community groups and health and social care providers to help them respond to people with dementia in a manner that maintains and enhances their dignity. The organisation received £1,000 from the 2016 Sport Relief Community Cash Fund to run dementia embracing community singing groups in Sedbergh. The grant was used to pay the Sedbergh Choir Lead to conduct the weekly sessions. The singing group enables dementia sufferers and their carers to continue to feel a part of their local community and feel less isolated, while enjoying a shared activity. The sessions also provide an opportunity to gain support from staff and other members of the group. It is well known that singing has a positive effect on people with dementia. The songs chosen are upbeat, usually from the 1950s and 60s, and resonate with the emotions of group members, improving their emotional wellbeing and providing psychological comfort. Dignity in Dementia is the only specific group in Sedbergh that supports those living with dementia and their family carers. Without the singing group, residents would have to travel to Penrith or Kendal to participate in dementia related activities. Many would struggle to access these services, as the carers themselves are often elderly and can no longer drive or on low income. Lesley Gill, Director of Dignity in Dementia, said: “When an individual gets a dementia diagnosis, they are likely to lose confidence and can withdraw from their local community. Their family carer can also become isolated. We help to address this and reduce the stigma associated with dementia. 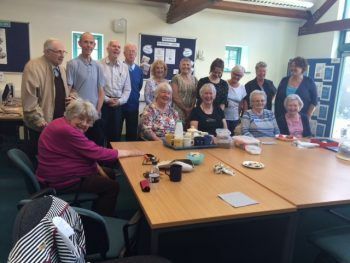 “Our dementia embracing singing groups enable individuals with dementia and their carers to stay connected to the local community and have fun while singing. Feedback from attendees indicates that both those with dementia and those without, find them a hugely important part of their lives. For more information on the services provided by Dignity in Dementia, visit www.dignityindementia.org.